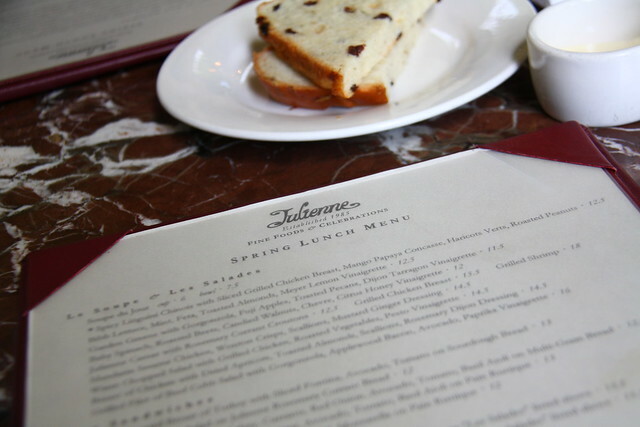 I actually wanted to try breakfast at Julienne, but it’s only served until 11:15AM on Saturdays. I couldn’t make it because I had a dentist appointment in the morning, but honestly, even though I love food, it’s a tough sell for me to wake up early on the weekends. When we arrived, my first impression was… wow! Fancy, schmancy! Since it was a beautiful day, we chose a table outside. Our meal began with bread service. I really liked the Rosemary Currant bread. Henry, on the other hand, isn’t a big fan of rosemary so I basically finished his bread for him. Since I looked at the online menu before we left the house, I was set on ordering the Sauteed Shrimp and Broccoli Curry with Steamed Rice. I was a little bummed when I found out that the menu posted on the website was Julienne’s winter menu and the curry was no longer available. However, there were a couple of other items that caught my eye. I couldn’t decide between the Tuscan Meatloaf with Spicy Tomato Chutney, Garlic Mashed Potatoes and Sauteed Spinach and the seasonal Fish Tacos so I asked our waiter for his recommendation. 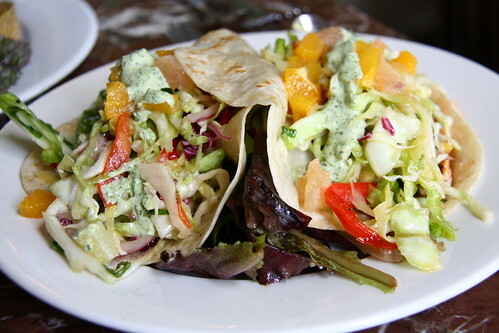 He said, without any hesitation, fish tacos. And they were SOOOO GOOD! The swordfish had a nice char, the citrus was refreshing and I absolutely LOVED the jalapeno aioli. 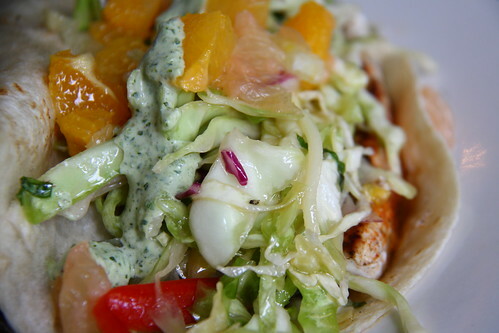 It was definitely the best fish taco I’ve ever had! NO CONTEST! 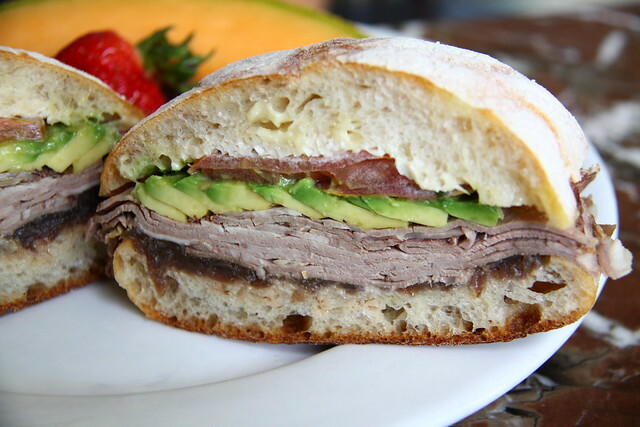 Henry ordered the Roasted Lamb with Caramelized Onions, Avocado, Tomato, Basil Aioli on Pain Rustique. We were both expecting a hot sandwich, but it was cold. Although it was a good sandwich, I really couldn’t tell I was eating lamb. If you told me it was roast beef, I would have believed you. The best thing about the sandwich was the caramelized onions. The dessert menu was presented to us with a tray of desserts. Cute points!! We were sold on the Blueberry and Lemon Bread Pudding. 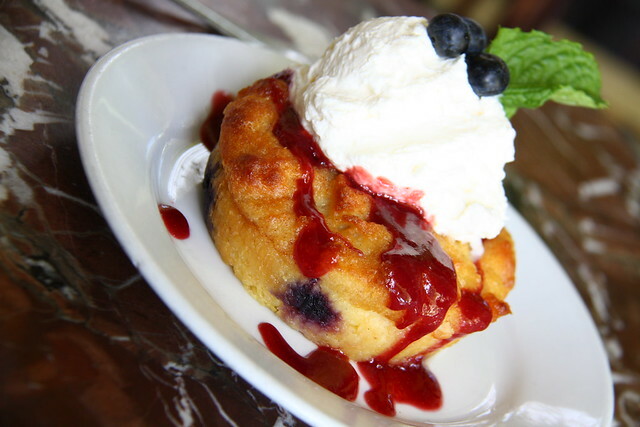 It was served warm, drizzled with raspberry sauce and topped with whipped cream. Delish!